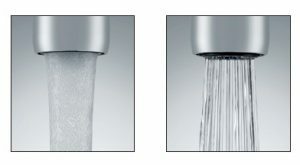 Energy & Water Conservation Blog – Page 3 – Ideas to Lower your Energy and Water Bills. As recently as 2010, the United States Department of Energy found that nearly 80 percent of lamps being used in commercial buildings were fluorescent. 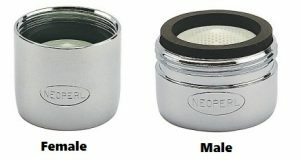 These lights are commonly found in large industrial buildings or other commercial edifices, such as hospitals and schools. 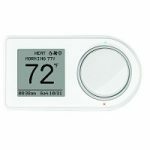 They provide up to 75 percent more energy savings than their incandescent counterparts. That being said, as LED technology updates and shifts, even more savings can be realized by switching from fluorescent tubes to LED T5 plug and play or LED T5 direct wire lamps. One of the major identifiers of any light is its wattage. This is the main indicator of how much you’re going to save when you switch. For example, a standard 28-watt fluorescent tube can be replaced by a 15-watt LED lamp. Additionally, a 54-watt high output fluorescent tube is easily replaceable by an LED that consumes only 25-watts of energy. With such a difference in the amount of power being used, savings in energy costs quickly follow installation. 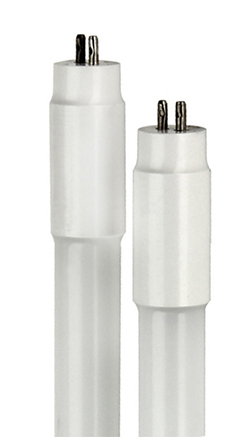 Plug and Play, or direct wire, LED T5 lamps make switching from fluorescent to LED simple. These bulbs are easy and quick to install. Replacing the ballast in your current fixture won’t be necessary, as it plugs directly into the fixture without any rewiring. This also reduces the the cost of labor and reduces maintenance for facility managers. Ballast bypass, also known as LED T5 direct wire lights are slightly different from their plug and play counterparts. These lamps cannot be installed without first removing the existing ballast in a fixture. This is because they operate using the line voltage that flows straight to the sockets, essentially doing what its name indicates, bypassing the ballast. On average, an LED T5 lamp is rated to last as long as 50,000 hours. This is more than double the standard 24,000 hour life of a fluorescent tube. Installing lamps with this long of a lifespan eliminates the need for frequent replacement. Also worth consideration are warranty periods. Standard fluorescent tubes have a warranty period up to 2 years. Conversely, the typical warranty period for LED fluorescent tubes is 5 years. These lamps are available in cool and daylight white and designed with high lumen outputs. This provides both consistent color and illumination for a seamless switch. 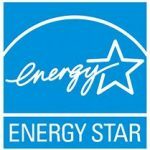 With lower power usage, longer lifespan, and a longer warranty, whether you choose an LED T5 plug and play or a ballast bypass lamp, you’re easily looking at saving as much as 45 percent on both energy usage and costs. Make your outdoor commercial environment safer and more energy efficient with Conservation Mart’s high-tech LED wall packs. 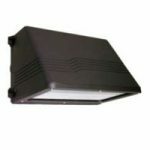 These high-quality lighting solutions are uniquely designed to help illuminate building entrances, apartment buildings, overhead door lighting and more at night, with styles that help lower light pollution so that your area is fully illuminated without disturbing the surroundings. We have standard and cutoff-style LED wall packs available. We recommend picking up LED cutoff wall packs if you’re looking for a great way to provide ample lumen output at night without high levels of light contamination. 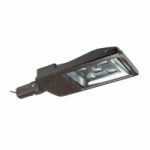 These LED fixtures work by directing the light downward rather than upward in order to keep light away from the night sky, so they are a popular option for illuminating parking lots and entryways. Traditional wall packs are a smart choice for covered and contained environments, such as beneath overhangs or in parking garages. With our selection of LED wall packs, you can take advantage of amazingly long lamp lives — 120,000 hours in some cases — as well as built-in features that ensure safe operation and easy installation with minimal maintenance. These lights are a solid choice for wall- or ceiling-mounted security lighting, walkway lighting, area lighting, parking lighting, schools, hospitals, hotels and more. At Conservation Mart, we offer low prices and incredible volume discounts on LED wall pack lights that can be used to effectively replace your incandescent, metal halide and fluorescent wall packs in commercial outdoor spaces.